Russellville School District (RSD) is currently accepting applications for the Preschool Program for the 2018-2019 school year. To be eligible, students must be 3 or 4 years old by August 1, 2018. Openings are available at all levels, including a no cost level (eligibility of program qualifications), a sliding fee scale level, and full fee level. The RSD Preschool Program is a full day of high quality preschool- Level 3 Better Beginnings, and includes a special needs program on-site and a child nutrition program. The curriculum used in the Preschool Program is connected to RSD K-12 curriculum and taught by teachers fully licensed in Early Childhood Education. Assistants in the room with the teachers are licensed or highly qualified, with the maximum staff to student ratio of 1-to-10. Students enrolled in the Preschool Program will have the same school year and school day as the rest of the district. All classrooms are located on RSD K-4 campuses with a full-time registered nurse and safe room on-site. 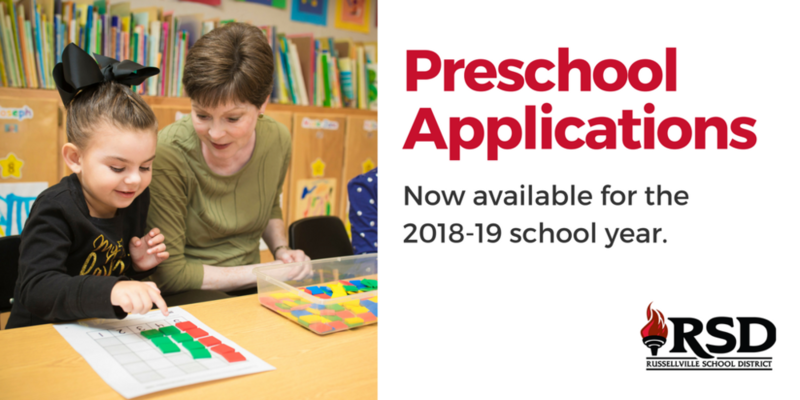 You can obtain a preschool application at the Gardner Building on 1000 South Arkansas Ave., in Russellville, or with this link preschool application. For more information about the preschool application process, contact Jenny Barber, Supervisor of Federal Programs and Preschool Education at 479-967-6025, jenny.barber@russellvilleschools.net.